An Augusta native returns to Georgia to perform in the venue where he first entertained the idea of becoming a professional dancer. As part of its 60th anniversary, 21-city North American tour, the Alvin Ailey American Dance Theater will perform at the Fox Theater in Atlanta this month. And Augusta native Christopher R. Wilson, a 2013 graduate of John S. Davidson Fine Arts Magnet School, will be part of the 34-dancer company. He was encouraged to pursue dance after another Augusta native, Russell Joel Brown, who appeared in national tours of The Lion King, saw him in a dance class at a local summer camp. 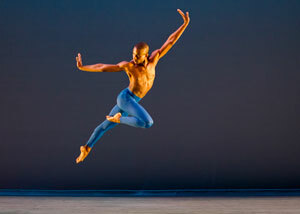 Wilson danced with Ailey II, which features young dancers and emerging choreographers, for a year, and after auditioning for AAADT in April, he joined the company in May. This will not be the first time he has returned to his home state since he became a member of AAADT, however. He came home from New York City during time off in October and taught dance and choreography at Colton Ballet School, Davidson and Jessye Norman School of the Arts. AAADT is a modern dance company that includes ballet, modern, jazz, hip-hop and contemporary dance artists, and the dancers will celebrate Ailey’s life and legacy with six performances in three different programs at the Fox. He believes the dance company gives people a platform for expression. He wants audience members to experience happiness, anger, joy or sadness through his performances. Published on January 20, 2019 in LIFE + STYLE and tagged front by Kristy Johnson.